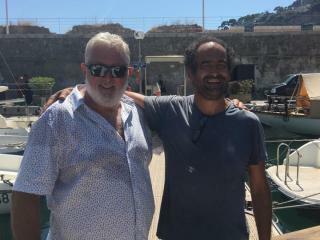 Malcolm Beaton and Mark Aichroth visited Chantier Pasqui in Villefranche Sur Mer last week.. This historic yard built rowing galleys in the 16th century and out of the same building they restore J class yachts. A visit is planned by the team at Chantier Pasqui to Gweek next year. Pictured: Malcolm with one of the craftsmen, Christoph.